"SecLib::RetrievePrivilegeForUser failed - no roles are assigned to user." 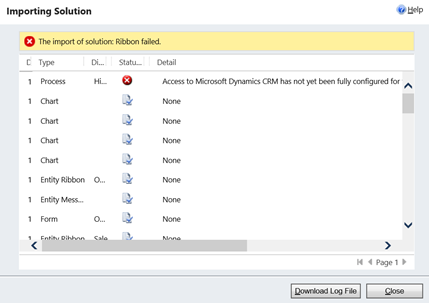 The first step in diagnosing these issues is to try and export the same solution using the CRM solutions area and then immediately re-import to see what error is shown. This is exactly what the Ribbon Workbench does behind the scenes. 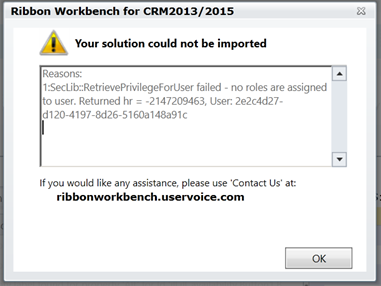 Upon Downloading the Log File you'll see that the error occurs on a 'Process' and the same error message is shown as reported by the Ribbon Workbench. The User ID is also given which can be used in a URL similar to the following to find the user record causing the issue. You will most likely discover that this user has been disabled or has no roles assigned – this could be that they have left the company or changed job role. You will need to find any Workflows or Dialogs that are assigned to them and re-assign to yourself before you can import the solution. "Published workflow definition must have non null activation id." The results can then be reassigned to yourself using the 'Assign' button on the results grid.